Register Log In ECN Forum Forums General Discussion Area Supporting service drop question. I have an apartment building. Service is being upgraded. The problem I have is in regards to supporting the service riser and drop. This building is a ranch style. Looking at the outside wall on the building. We have a wall, go up 8' and we have the soffit. The soffit comes out approx. 15". Then we have a low angled, roof with shingles. The top of the roof is approx 11' off the ground. This is where the problem is... I need 18.5' of clearance from the ground. I have to go around the soffit or through the roof. I have seen angle iron support on commercial buildings, even offset angle iron, but I have never seen it as tall as 8' off the roof. The inspector said guide wire is not an acceptable means of support. It sounded like guide wire is never acceptable, thought I heard it was, but again never installed one. My guess is I need a welder to weld angle iron with an offset to the correct dimensions. Mount that to the brick wall and go ahead with the rest of the install. Those are not unusual in Florida. 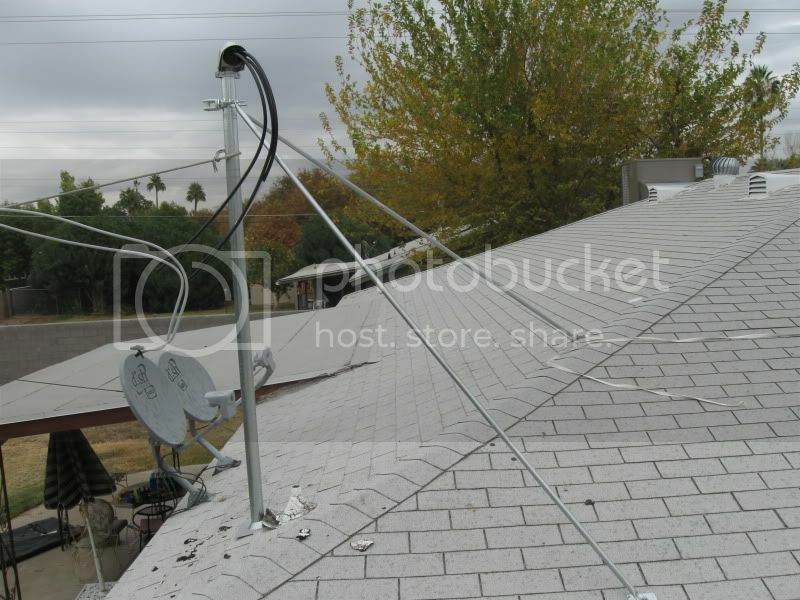 it is typically a 2 1/2 RMC mast well strapped to the wall, through the roof with a 2 legged brace on the back side, screwed into the roof framing members, at the edge behind the facia and at a spot a couple feet in. This is all bolted together, no welding required. There is a clamp around the pipe with a flange where you bolt on the legs. I suppose you could put in a 3d leg and support it in all directions but usually the drop is plenty that way. This 2 legged brace can be found at the supply house? Any pics of this type of install? Last edited by Trick440; 05/11/15 10:15 PM. Apparently that is 3/4 emt, pounded flat on each end, with a hole drilled through it for bolts. You'll probably want to take a copy of that picture with you to the supply house. SOME supply houses- not all- sell "mast kits,' kits that include the brackets and screws. In addition, you will need two sticks of RIGID, not EMT, to go with the fittings. In addition, they're available from the internet. For example, Platt Electric sells their MKR-2 for $30.00. Your PoCo will have the specs of what support they require. In certain circumstances, they MIGHT accept guy wire / aircraft cable. Technically, you are to set the screws into the roof framing, not just the roof decking. Good luck finding it! In any event, take extra care in sealing the screws, or you'll be paying to have the roof fixed. In practice, line crews are usually happily surprised to find a mast with additional support. FWIW, when I do such a mast, I usually paint it to match the roof color. One more note: The height you require will need more than a 10-ft. piece of conduit. I see two ways to do this: the 'legal way, and the 'better' way. The legal way is to cut a shorter piece from a second stick, thread it, and have the coupling below the eave. The 'better' way is to use schedule 40 galvanized water pipe. Though not listed as conduit - and thus, a technical violation- the stuff comes in 21-ft. lengths, and will let you make the mast without interruption. Please make sure you check with the serving utility (POCO) for any spec they have. As to thebraces, back when TV antennas were popular, along with CB antennas, a place like radio Shack (or equal) had antenna tripods that you could easily adapt. Most had an ERTL label on them!! I've seen everything from guy wire to steel beams used. BTW, the 'mast kit' has a rubber boot and insulator included.